With the remarkable improvement growth of people's living standard, there are increasing numbers who pursue more advanced electronic products, which undoubtedly include iPhone. Accordingly, advanced products being a symbol of society progress accompanies with high technology that differs from others. Taking iPhone X as an example, that one issue causes headache is that HEIC, the new image format of iPhone X, can only support iOS 11 and macOS High Sierra so that they cannot be viewed on any other devices. If you are an iPhone user, you would certainly like to solve this problem. Do you desire to find a practical solution to convert your HEIC image to JPG or other formats? Maybe you just want to convert a few images. I guess you will need one that can be used in an urgent time. Thus, there is no need for you to buy an offline converter. 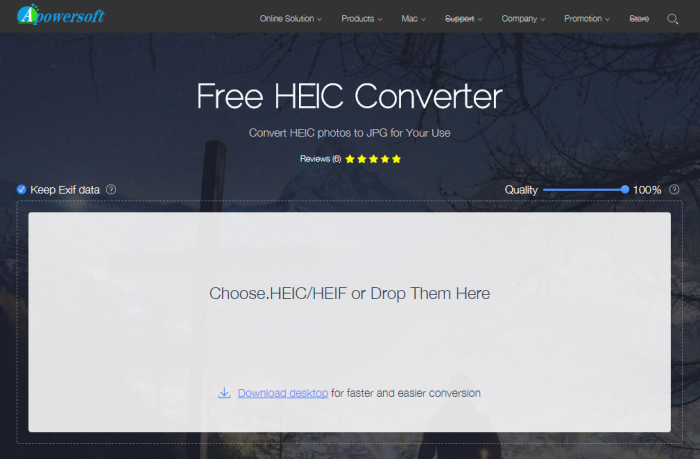 To bring convenience to you, we here list four best free online HEIC converters, with which you can easily remove misgiving by converting the HEIC images to JPEG in seconds without installing anything on your computer. Apowersoft Free HEIC Converter, which is also an online converter, enables to convert HEIC images to JPG. If you need, you can also download a desktop app. However, the desktop one can only have Windows version which can support 60 pieces of images each time and is faster than online one. Anyway, the online converter is really simple to operate. With a tidy interface, it is of great convenience. You just need to click one of your browsers and enter the website: www. Apwersoft.com, then an easy-to-use online solution will be shown. What you need to do is to follow what is represented in interface. Click the "Choose .HEIC/HEIF or Drop Them Here" button and add the HEIC images that need to be converted. Apowersoft Free HEIC Converter will help you to convert all these HEIC images. Furthermore, the EXIF information can be kept during the conversion process. It can convert a single HEIC images at a time or convert multiple images that up to 30 files. After the conversion ends, your images will be deleted completely without leaking your privacy information. Converter.asimkt.com can provide you with an online HEIC to JPG Converter when there is no time for you to download an application and install it. What distinguish it from other online converters is that it cannot make multiple HEIC images batch conversion come true. According to what is written in the interface, you can only select a file to add into converter. It also requires you to transfer your HEIC images to computer first and converted photo is stored in their server, which means you need to click on the image and download it if you want to save it in local folder. Most importantly, you have to pay much attention to one thing that there is no "delete" and "clear" button to allow you to remove converted photos from cloud. If you have more choices and have enough time to make decision, you can think deeply about which one to pick up considering the privacy problem. 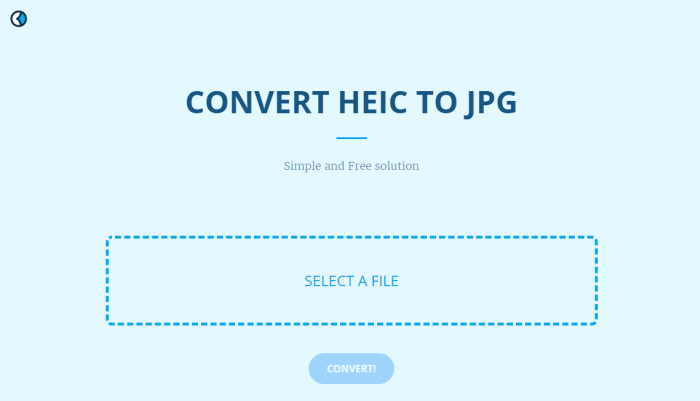 As a free online converter, HEIC to JPG.com can convert HEIC images to JPG format with only one step and no more complicated operation. What can be regarded as its advantage is that it can convert HEIC files with maximum amount of 50 pieces, which is larger than other online converters. However, you also need to transfer HEIC images from your iOS 11 device to computer. After conversion, the converted images will be stored in cloud so that you have to download to computer too. As far as I am concerned, it will not satisfy you owing to quality cannot be adjusted for converted files. Maybe it will have no big influence on your experience supposed you are just a beginner and just want to have a try. Aconvert.com is a useful online website well designed to convert HEIC files to JPG format. You can enter it directly owing to there is no requirement for you to sign-up for an account. That is why online converters can enjoy high popularity. The whole conversion process can be done within a few seconds by using this powerful tool. What need to be mentioned is that Aconvert.com can allow you to change the size of your HEIC image before you convert it. Moreover, it can not only support JPG format, but also other output formats, for instance, PNG, TIFF, GIF, BMP, TGA, DDS, etc. You are permitted to click "FILE" or "URL" button to local file or online file, meaning you can select a file from your computer or even enter an online file URL. The file size of HEIC image imported can be up to 200M. When start to conversion, the converter will automatically retry another server if one failed. Besides, converted file can be located in "Conversion Results" section. But please keep in mind that this free online converter cannot convert files in batch. Admittedly, each of the above free online HEIC to JPG Converters has its own attractive points. However, it will waste your valuable time downloading all converted images from cloud server especially when there are thousands of photos. If you need, you can try to use an offline HEIC Converter, Joyoshare HEIC Converter, which is professional and top-leading. It has covered all functions of online HEIC to JPG Converters and better than them. Frankly speaking, it is worthwhile for you to possess this all-in-one HEIC converter!